Supposed to have been constructed in 345 AD is a catholic shrine dedicated to Mother Mary in Kerala known as the St Mary’s Forane Church. This “ancient” church is situated in a town called Kuravilangad in the Kottayam district. This church possesses a statute of Mother Mary supposed to have been made out of granite. Furthermore, this idol of Virgin Mary is commonly referred to as “Kuravilangad Muthiyamma” by ardent devotees. In addition, this church is renowned for a three day feast known as “Moonu Noimbu” which attracts a large number of people from across Kerala. 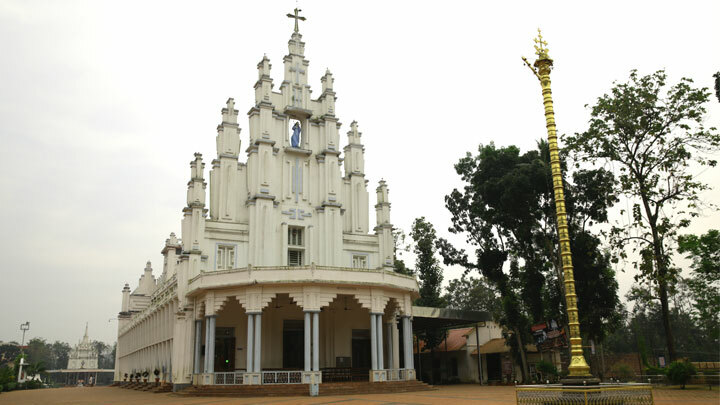 If you intend to drive to St Mary’s Forane Church then the starting points located in close proximity would be Thrissur, and . a. How to reach St Mary’s Forane Church from Thrissur : The shortest route to reach St Mary’s Forane Church from Thrissur is via NH 66 and NH544 as depicted in the map above. Alternatively, click on the Google Maps link here to view on Google Maps. b. How to reach St Mary’s Forane Church from Alappuzha : The fastest route from Alappuzha to St Mary’s Forane Church is via NH 66 and the route map is depicted above. Alternatively, click on the Google Maps link here to view on Google Maps. According to a popular myth prevailing in the village of Kuravilangad it is said Mother/Virgin Mary appeared for the very first time to mankind at this village. Apparently one day virgin mother appeared in front of a few children belonging to this village and instructed them to construct a church in close proximity to a water spring supposedly possessing miraculous powers. It was then that these children informed their elders about the mysterious appearance of Mother Mary which eventually resulted in the construction of this church. Furthermore, the water spring in close proximity to which this church was constructed exists even as of today. Click on the link here to check out the places to stay near St Mary’s Forane Church, Kerala on Google Maps.